DR. C. Bakala is a Facial Cosmetic Head and Neck surgeon specializing in Facial Cosmetic surgery, Head and Neck reconstructive surgeries and Laser Skin Care. He is trained in Otolaryngology – Head and Neck Surgery – as well as fellowship trained in Facial plastic and Reconstructive surgery. Dr. C. Bakala’s practice stands apart from the rest in the fact that he focuses solely on procedures, surgical and non-surgical, relating to the face, head and neck. Faces of Kelowna offers a wide variety of service from the medically necessary to simply cosmetic enhancements. This can include the surgical removal of minor and major tumors of the head and neck, medically necessary nose surgery or cosmetic surgery to aesthetically enhance your nose or face. Being a specialist, DR. C. Bakala offers the patient the advantage of choosing a doctor that is highly skilled surgically and who uses the latest in technology. Specializing in Facial Cosmetic Surgery and Laser Skin Care, Dr. C.D. Bakala, M.D. FRCSC, is an award winning surgeon who has been practicing in Kelowna, British Columbia since 1996. 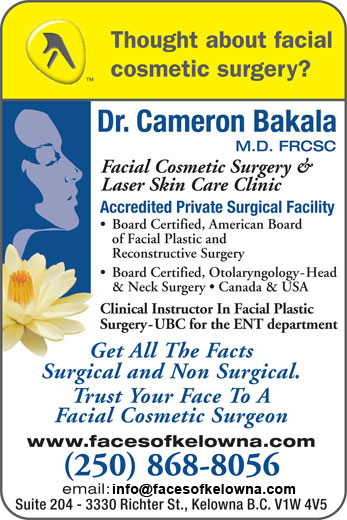 Dr. Bakala is also the Western Canada Regional Director for the Canadian Academy of Facial Plastic Surgery. Dr. Bakala and his staff of registered nurses, offer the latest in cosmetic and laser surgery treatments and procedures, providing his patients with both surgical and non-surgical treatments for facial aging, wrinkles and photo-rejuvenation. Working closely with each and every patient, Dr. Bakala develops personalized strategies that include procedures, treatments, and lifestyle changes that will help you to look and feel your best. areas for your comfort and confidentiality.